The restaurant Atrium is a big place. Walking through the stony path, eyeing the oriental designs over the entrance, the stairs with lamps hanging from wooden poles on the left hand-side of the restaurant, up to the scenic essentials on both sides of the path, and looking at one of the most beautifully decorated garden roofs gives one the idea of a conventional Chinese outlook. The first thing you notice at Atrium is the décor inside--lighting and the general atmosphere which makes for a romantic night out, even though it would also be appropriate for friends or business. The welcoming wait staff will be waiting for you to dine at a simple yet stylishly designed black polished dining environment. A soft aroma of light allowing the alluring curvatures and artsy designs on the wall to come to life would definitely remind you of a posh cookery. The set-of-choices goes by Starters, Main Courses, Salads and Desserts. The mafia menu is flavorsome for a food connoisseur's taste bud as it caters to a wide range of cuisine--Continental, Oriental (Thai) and Indian. The stomach's trip to the continental menu gives anything from lip-licking shrimp cocktail to Greek salad, French onion soup up to a wide range of scrumptious steaks. The list goes on as your mind ventures into the food land. Chicken grilled and different beef and lamb steaks, both garnished with mashed potato, boiled vegetables, different sauces and topped with hot gravy and a nice dressing looks absolutely delightful--scrumptious is the word as heavenly is the feeling inside your mouth!! In the Thai section, apart from the popular hot and sour soups, the specialist chefs tickles the taste buds with Khao Pad Gai/Goong and Neau--fried rice with Thai herbs and chicken, prawn and beef. The salads and the sauces, which adds nicely with the various dishes are indeed yummy. The range of fishes, fried, steamed or grilled, makes a lasting impression. They are quite mouth-watering and one would definitely take extra helpings. Various preparations of crab and cuttlefish are high on demand and taste. The range of noodles both on and off gravy make it intensely palatable when hunger strikes. The distinctive aroma of Thai spices with a mixture of minced meat salad and fresh vegetables were extremely delicious. The Indian set-of-choices have fresh Tandoori kebabs, range of exclusive breads like Lassa Pudina Paratha, Peshwari and Kashmiri Naan, dishes like Achari Gosht and Fish Tikka Masala, Dal Makhani and Biriyanis are in words, simply wonderful. The sparkling Blue Moon, Pina Colada…Virgin Mary and blend of other juices, root beer, Lassi, Zeera Pani and range of teas were excellent thirst-quenchers. The stunning and cozy sitting arrangement on the roof, exceptionally designed for musical gigs and plenty of air is just the environment one would want to have Shisha. Their range of flavors and exquisite designs of Shishas (the individual parts), the green around and above all the decorations combine to make it quite atmospheric. Some people might think the restaurant a bit costly but the food connoisseurs would definitely find value for their money. The bottom line--Atrium is a great eating out place. 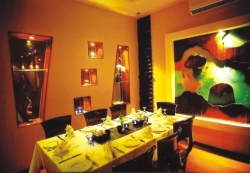 With its exclusive menu, it is a splendid restaurant and will definitely add flavor to our food business. Atrium is situated at 50/52, Pragati Swarani, Block J, Baridhara.